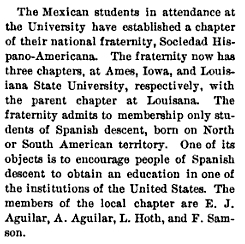 When were the first Mexican student associations founded? On my first blog post last fall, I shared evidence of what I still think is the one of the earliest specifically-Mexican student clubs in the United States at Lincoln Memorial University in Harrogate, Tennessee. The fact that this organization was founded at Louisiana State University makes sense given that many Mexican students from the Yucatán Peninsula, located in the Caribbean, attended college in the U.S. South, the easiest region for them to access. But I am surprised that the second and third chapters were founded in Iowa. I’ll report back when I find more information on this.